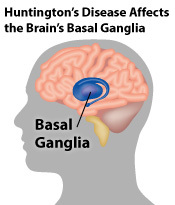 Huntington’s disease can cause one of the rarer forms of dementia. Rarer forms of dementia account for only around 5 per cent of all dementia cases in the UK. Huntington’s disease is an inherited disease causing abnormal movements and problems with coordination. Other symptoms include mood problems and cognitive impairment that gets progressively worse over time. The age of onset and the course of the disease varies for each person, and dementia can occur at any stage of the illness. Symptoms of dementia associated with Huntington’s disease mainly include difficulties with concentration, planning and organisational skills. A loss of short-term memory may also occur. People with Huntington’s disease may also develop obsessive behaviour. This form of dementia differs from Alzheimer’s disease in that those affected continue to recognise people and places until the very late stages of the illness. At present, there is no cure for dementia associated with Huntington’s disease, but research is being carried out to try to find treatments for the future. For more information contact the Huntington’s Disease Association (see ‘Other useful organisations’). 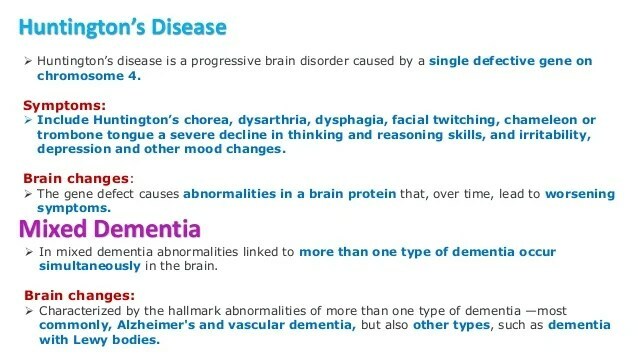 I found a bit more information on Huntington’s disease to share, this time from AlzAids.com. They are a company out of Mississippi who offers various health-related aids and products through their website. The cause of this disease is believed to be from one defect on a single chromosome. This gene is in every person and it has a triplet repeat sequence. In someone with this disease, the gene has a large number of triplet repeats. Huntington’s will not skip a generation, and every child of a parent that carries this defective gene has a 50/50 chance of getting that gene and developing the disease. If you do not inherit the gene from an affected mother or father, it cannot be passed on. It is thought that 250,000 American have the disease, or are at risk of developing the disease. Early on, the symptoms of your loved one could be mood swings, depression, clumsiness, forgetfulness, twitching and poor coordination. As the disease starts to get worse, short term memory gets worse and involuntary twitching of the head, trunk and arms/legs can increase. Walking, speaking and ability to swallow will diminish. Later in the disease, the person will need complete nursing care in the home or in a specialized facility. Death usually occurs from heart failure, various infections or choking. There is no effective treatment or cure for the disease. Research continues on treatments that can at least reduce symptoms and delay the progression of the disease. There are some drugs that can be given to people in the midstages of the disease that can really improve their quality of life. Good nutrition, exercise and careful arrangements of objects in the home can help to minimize the consequences of Huntington’s Disease. Fortunately, there are a great many products that can help you to deal with your loved ones’ Huntington’s or Alzheimer’s disease to greatly improve her quality of life. For example, we recommend the Safe-T-Mate Personal Safety Alarm. This product will alert you when your loved one gets up from a chair or bed. The alarm will sound when the cord comes off of the unit. Also consider the Posey Gait Belt, which can help your loved one when they walk, sit or stand.